B.N.M. 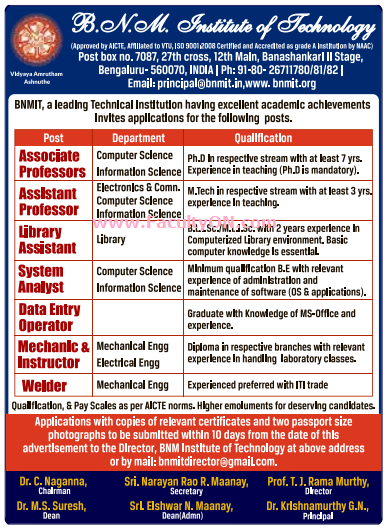 Institute of Technology Bangalore has advertised in DECCAN HERALD newspaper for the recruitment of Teaching Faculty- Professor / Associate Professor / Assistant Professor Plus Non-Faculty jobs vacancies. Interested and eligible job aspirants are requested to apply within 10 days from 20th June 2018. Check out further more details below. About College: BNMEI – B.N.M Educational Institutions was established by the trust Bhageerathi Bai Narayana Rao Maanay Charities in the year 1972. The Managing Trustee Shri. N. Raghunath Rao Maanay along with Prof. Sunanda P Jadhav the founder Secretary and Principal founded the institution with a focused vision to impart value based quality education irrespective of social, financial or religious status. Prof. Sunanda P. Jadhav strived to provide education at affordable cost especially to the girl child and her unstinted efforts yielded highly commendable results.From a humble beginning the BNM group of Educational Institutions is now a leader in the field of education, providing the most modern education while maintaining the rich cultural heritage of the great India. How to Apply: Interested and eligible candidates are requested to send application along with CV, copies of certificates and 02 recent passport size photo the email address or postal address given below. Reference: Advertisement from B.N.M. Institute of Technology Bangalore on DECCAN HERALD newspaper dated 20th June 2018 for the recruitment of vacancy position such as Associate Professor / Assistant Professor and non-teaching faculty jobs. See the copy of advt below.